Valley Fisheries is located in Balm, Florida. The site was originally a blackwater swamp flowing into a small river named Bullfrog Creek until the Army Corps of Engineers organized things in the 1950’s. Ponds were excavated in the late 1960’s during the fledgling years of the ornamental tropical fish industry in this area. The land changed hands several times during the 70’s and 80’s until the current family purchased it in 1991. It was operating as a tropical fish hatchery under the name of Valley Fisheries, which has been retained to this day. Since 1991, the entire operation has been renovated. The ponds were cleared, rejuvenated, and replumbed with air and water. The wastewater retention ditches and ponds were redug. 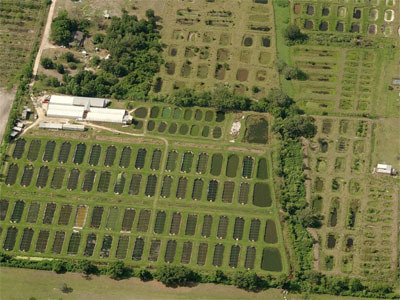 Over 70 greenhouses covering outdoor growout ponds were built. The four existing buildings were renovated and four new hatcheries built to support the production and experimental breeding programs, the larval fish management program, the indoor high-tech growout program, and the wholesale and internet sales programs. Since the beginning we have been improving, revising, upgrading, and generally perfecting our operations in the areas of health, nutrition, genetics, micro-biology, live transport and general animal husbandry. All efforts have been fueled by the goal of supporting home based planted aquariums filled with exotic oddball tropical fish. 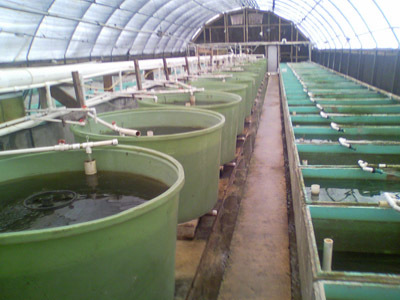 We have experimented extensively in our hatcheries and home aquariums and have developed many techniques, procedures and standards that we believe will allow beginning and advanced hobbyists alike to continue the success of Valley Fisheries in their own home aquarium. Please review the BIO DIFFERENCE section for what we believe is a very enlightening discussion of what makes our fish different and how you can benefit from our unique approach to our hobby.